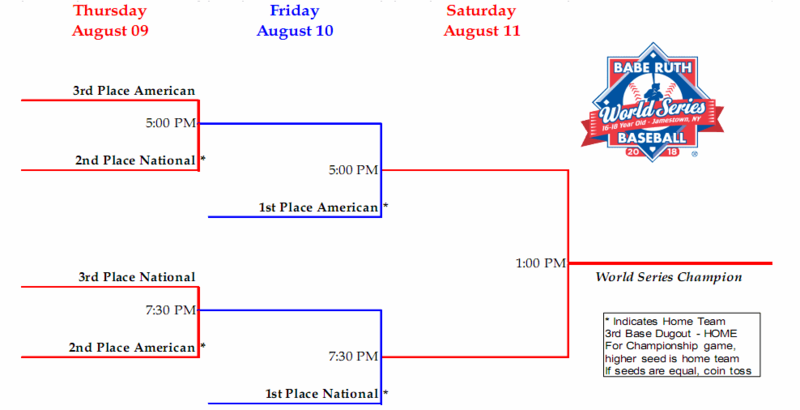 The 10-team World Series field is comprised of the champions of each of the eight national regions (New England, Middle Atlantic, Ohio Valley, Southeast, Midwest Plains, Southwest, Pacific Northwest and Pacific Southwest) as well as the Western New York State Champions and the Host Team. Teams will be split into two divisions, National and American. Each of the 10 teams in the World Series will play four round-robin style games over the first five days of play. Each team will play the other four teams in their division once. A tie in standings will be broken by head-to-head records then fewest total runs allowed. After pool play the top three teams in each division will advance to a single elimination bracket, with the top seed in each division receiving byes.